…then I have news about a remarkable breakthrough that can help you grow new gray matter – i.e. new brain cells – and supercharge your mind and memory. All starting in just four weeks and all without doctors, drugs or dangerous side effects. What’s more, in this Special Report, you’ll find how this discovery can help protect you from the two main causes of brain failure—and even reverse its symptoms. As you age, your brain shrinks up to 15 percent, a change linked to poor memory, depression and dementia, according to Proceedings of the National Academy of Sciences. But think how great your life would be if you could always remember where you put your keys, glasses or TV remote…easily remember names and faces of acquaintances you haven’t seen in decades…quickly relive your favorite vacations, weddings or special family events…and even show off your “smarts” to the younger generation. Sound farfetched? Not if you take advantage of something that’s far different than the typical herbs, nutrients or vitamins people take to boost and protect their brains. What is this mineral powerhouse that’s winning so many rave reviews? It’s something you’ve likely heard about before because mega doses of it—available only by prescription—have been used since the early 1970s to treat serious mental conditions such as bipolar disorder, schizophrenia and depression. And because of its remarkable effectiveness in helping even “hopeless” cases, millions of people with these problems take it every day. The 100% natural mineral breakthrough I’m talking about is lithium, which new medical studies reveal—even in tiny doses—has a powerful and surprisingly positive impact on your brain. 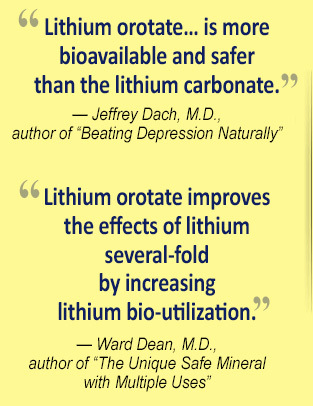 For over 40 years we’ve known that lithium treats mental illness. for serious brain disorders—we ALL need it! Startling new research reveals that low doses of lithium—available without a prescription—should be taken by most everyone who wants to grow new “gray matter”…restore and rejuvenate brain cells …boost memory… “de-age” the brain…and stay mentally sharp for years to come. 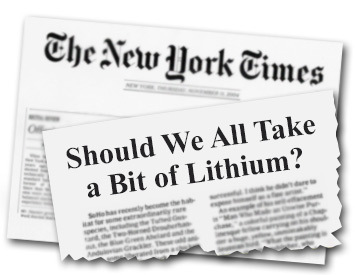 No wonder the New York Times recently published an article titled, “Should We All Take a Bit of Lithium?” In it, they report that “relatively tiny doses of lithium can have beneficial effects”…including promoting brain health and improving mood. The truth is, one of the most powerful solutions for age-related memory loss and cognitive decline has been right under the noses of the brain “experts” since the 1970s, but they didn’t know. Why? Because -- while it was known that lithium treats serious mental illness -- no one knew that in small doses it could also help boost and protect a healthy person’s brain and fading memory—which are completely different problems. But now that’s all changed…and in just a moment, I want to introduce you to a new natural breakthrough formula of low dose lithium that can do wonders for your brain, mind and memory called: Brain Essentials: Lithium Orotate. As you’ll see, mountains of clinical research prove its effectiveness, plus you’ll learn why one special type of lithium allows for greater absorption and better results for you, even in low doses. First though, let me introduce myself and tell you how I first learned about lithium and its astounding ability to boost and safeguard your brain. 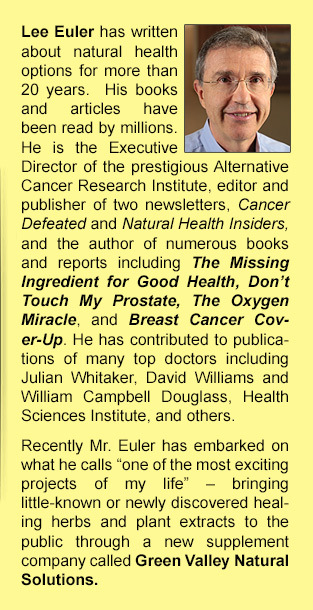 My name is Lee Euler, and for more than 20 years I’ve been an advocate for natural health and healing—as a writer, publisher and advocate of health freedoms. I also know first-hand how devastating mental decline can be. Take the case of Florence. If you’d known Florence as I did, you’d know that for most of her adult like, she was sharp, intelligent and witty—easily juggling her many personal and social matters with ease. But then in her late 70s, she began to have small memory lapses. Then bigger and bigger memory problems like forgetting to pay her bills, failing to deposit her checks in the bank and repeatedly forgetting to take her medications—things she had always been very efficient about. As things got worse, Florence had to go into a nursing home. And before long, things really started to go downhill. She was unable to recognize familiar faces. She would look at me like she should know who I was—but couldn’t remember. It was horrible to see her like that. Florence didn’t just lose her mind—she lost her memories, her personality and herself—all the things that made her so special. I know. Florence was my mom, and watching her fade away was heartbreaking. It was also frightening for me. After she passed away, I vowed that I would do everything in my power to safeguard, protect and boost my own brain, mind and memory—and help others do the same. My passion for this cause led me to publish two best-selling books, Awakening from Alzhiemer’s and How to Save Your Brain. Yet in my research of brain and memory protecting breakthroughs, I was frustrated by the quality of the supplements I was seeing—and the fact that some of them were so hard to find. 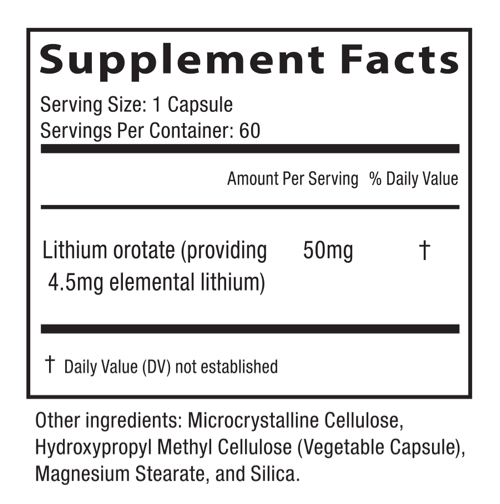 Almost no one was reporting about lithium orotate—and health food stores didn’t carry it. So I finally decided the best way to make this valuable mineral available to everybody was to get together with a supplement company and bring it to the general public myself. Without a doubt, Brain Essentials: Lithium Orotate has helped keep my mind and my memory young and razor sharp—as good or better than any other herb, nutrient or mineral I’ve tried. Researchers at the University of Pennsylvania School of Medicine report that lithium blocks the development of beta-amyloid tangles and plaque found in brains of people who have succumbed to Alzheimer’s disease. Left unchecked, tangles and plaque in your brain contribute to the damage and death of brain neurons – your precious brain cells. The good news is, research conducted by developmental biologist Peter Klein of the University of Pennsylvania School of Medicine reveals that lithium prevents (A) damage caused by beta-amyloid plaque and (B) further damage to healthy brain cells. He also found that lithium works to stop the progression of bird nest-like tangles that can choke your brain’s circulation and function. How does lithium work so effectively at quelling these problems? Both brain tangles and plaque have significant traces of a telltale protein linked to brain abnormalities and brain failure. Peter Klein’s study reveals that lithium works to block or suppress the actions of this harmful protein—giving your brain superior protection. 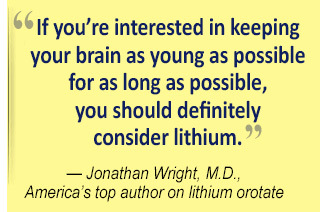 Dr. Jonathan Wright, one of the nation’s foremost experts on lithium, maintains that this mighty mineral inhibits the formation of brain tangles associated with brain failure. Now, government authorities have not yet accepted this safe, inexpensive mineral as a way to treat or prevent dementia. They may be right: More study is needed. But I’m so impressed by the evidence we already have, I’ve been taking lithium orotate for years. I can feel the difference. It’s completely safe, costs almost nothing and if there’s even a chance it reverses those brain tangles – I’m on board! Protect your brain from devastating tangles and plaque with the same lithium orotate breakthrough I take. Even better, you won’t have to pay anything but shipping & handling today! 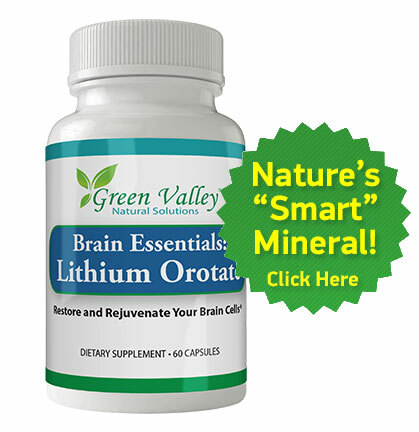 Go here to order Brain Essentials: Lithium Orotate. There’s even more to this. . . This was first proven in test tube studies he conducted. In laboratory study, nerve cells were treated with glutamate (a brain chemical)—and all of the cells were destroyed. That’s because – while glutamate is healthy in small doses because it stimulates brain neurons – in large amounts it can cause damage to brain cells. It’s a medical fact: When you suffer a stroke or other serious brain trauma, high levels of glutamate are released. The sudden surge of this natural body chemical increases the death rate of brain cells. When lithium was added to the cell culture before glutamate, all the cells were almost completely protected from glutamate’s damaging effects. He also gave lithium to rats for a few weeks, then triggered strokes in them by artificially blocking the arteries that feed blood to their brains. The results? Impressive! Rats taking lithium experienced 56 percent LESS brain cell death and significantly fewer neurologic deficits than the control group that did not receive lithium. 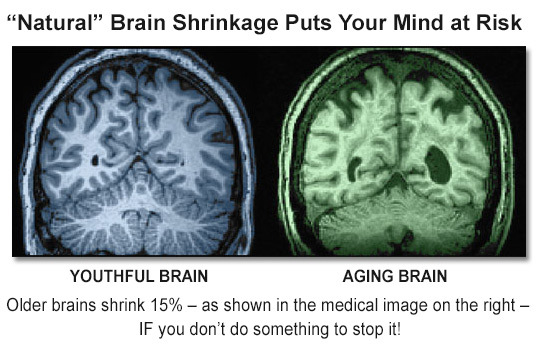 Did you know, as you age, your brain shrinks as much as 15 percent? 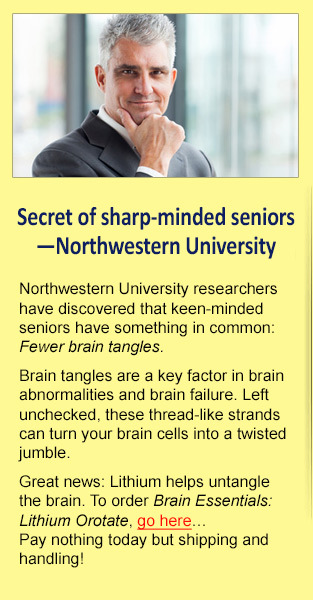 Natural cell mechanisms wear out…grooves in the brain widen…and damaged brain cells become a tangled thicket. Eventually, this loss of brain cells and their billions of connections leads to atrophy of the brain – in other words the brain shrinks and shrivels up. Areas especially vulnerable to shrinkage are the two parts of your brain responsible for your memory and cognition, as well as your personality. Most people and even many doctors think there’s no way to avoid a shrinking brain as we get older. They’re WRONG! The prestigious medical journal Lancet reports that “Lithium increases human brain gray matter.” As you may know, gray matter is the matter found in the outer layer of your brain known as the cortex. Further proof? Researchers treated mice with lithium in dosages equivalent to human therapeutic range. Then they performed autopsies and examined their brains. in human brains? You bet! Researchers at Wayne State University studied ten patients (average age 33) who suffered from bi-polar disorder, a serious mental condition. For four weeks, they gave the patients a daily therapeutic dosage of lithium. Then, they did MRIs on the patients’ brains and compared them to scans done at the beginning of the study. No herb, nutrient or mineral I’ve ever seen can help you grow new gray matter and “de-age” your brain like lithium—and as the study above proves, you can start getting results in just four weeks! 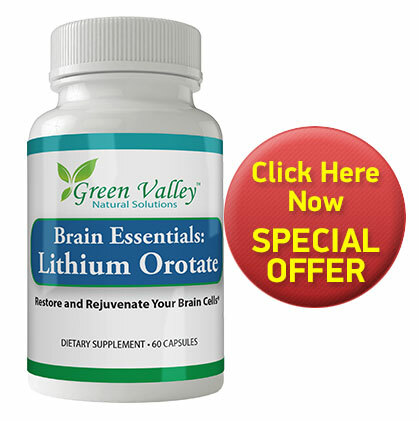 To start growing new gray matter, go here to order Brain Essentials: Lithium Orotate. With this offer only, the supplement company – Green Valley Natural Solutions – has made special arrangements so you won’t have to pay anything today except shipping and handling. Too much exposure to heavy metals like mercury, aluminum, lead and cadmium can have toxic effects on your brain and erode away brain mass, both of which can start your memory and concentration on a downward spiral. Worse, heavy metals can trigger depression and anxiety by disrupting your brain’s chemistry. And to add insult to injury, heavy metal toxicity can lead to major brain disruptions. And Science Daily recently reported the first case study linking aluminum toxicity with brain failure. The good news? According to the Global Healing Center, lithium provides robust protection from heavy metal toxicity. Lithium has been shown to protect cells from mercury, lead, aluminum, arsenic and cadmium toxicity. Animal studies indicate lithium has a protective effect against toxic metals. What’s more, Neuroscience Abstracts reports that lithium sweeps toxic metals like aluminum OUT of your body to keep your body and your brain safe from their devastating effects. I’ve found lithium to be far more than a miracle mineral that protects the brain from the devastation of mental decline and failure. It can also make you smarter. That’s why I call it the “smart” mineral. Animal studies showed lithium improved the ability of rats to find their way through a maze, as compared to untreated rats. In fact, the Society of Neuroscience reports that lithium helped improve spatial memory and sense of direction in just 24 hours—based on animal studies. But can lithium help you sharpen your brain power? No question about it! Case in point: The level of a certain substance known as NAA is one way to measure your brain’s ability to function and to get smarter. Research shows that low levels of NAA reflected diminished nerve cell viability, cell loss and decreased function of the brain (Prog Neurobio 1995). 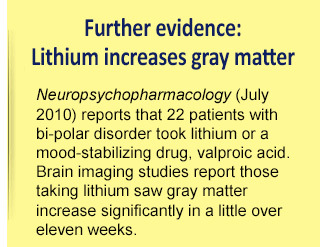 But in a 2010 study reported by Biological Psychiatry, 19 volunteers were given lithium every day for four weeks. The results? 14 out of 19 of those taking lithium had significant increases in NAA. That’s not all. Lithium also resets healthy connections between damaged nerve cells and restores fast-acting synapses that keep your cognitive functions sharp. Perhaps you’re frustrated by mental lapses that seem more and more common. Like forgetting where you put your car keys or glasses. Not remembering a doctor’s appointment or a family get-together. Or failing to remember the name of an old acquaintance you haven’t seen in some time. 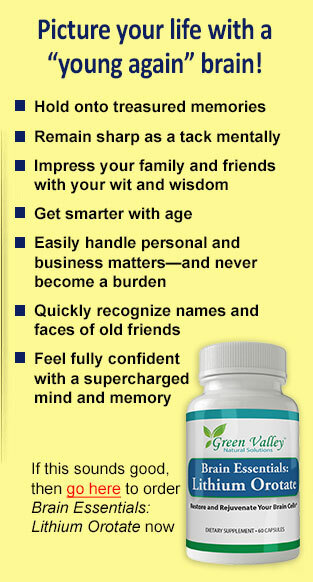 Or maybe you’re worried about early onset of more serious mind and memory problems. Whatever the case, lithium safeguards your brain from being hammered by everyday wear and tear…by memory-robbing toxins in the environment…and by risk factors that cause premature memory loss and brain failure. Even better, lithium helps improve your memory, brighten your moods and boost your brain health—all to give you a sharper mind and increased protection from memory loss. In all, this amazing “smart” mineral supercharges your mind and memory in all six ways I’ve just described…safely, naturally and quickly. Now, let me make something very clear. Government agencies and most of the medical profession have not accepted lithium as way to treat, cure or prevent any disease (except in large doses, for people with serious mental disorders like bipolar). It’s all still under study. And of course there isn’t much funding for research into a mineral that costs only pennies. Nobody is ever going to make a billion dollars from lithium orotate. Maybe in 20 years there will be enough evidence to satisfy the authorities. But I’m 63 and I can’t wait that long. Lithium is completely safe – I’ve already been taking it more than ten years. The studies already published are extremely promising – I’d say they’re beyond promising. Here’s a very important fact: Not all lithium is alike. If you want to grow new gray matter, new brain cells and supercharge your mind, you’ll want to take this special form of lithium: Lithium Orotate. Many people with serious brain disorders take pharmaceutical lithium carbonate, but the carbonate ion has difficulty crossing the blood-brain barrier and reaching the brain. This is why mega doses are usually prescribed. On the other hand, the orotate ion more easily crosses the blood-brain barrier, speeding this remarkable mineral to your brain. This is why Lithium Orotate can be used “in much lower doses with remarkable results and no side effects,” reports Shaheen Lakhan, M.D., author of Nutritional Therapies for Mental Disorders. Even though high doses of lithium are used successfully for mental disorders, let me be clear: Contrary to popular belief, lithium is NOT a drug. It’s a mineral salt like potassium found in nature. And in the low dosages used in the new formula Brain Essentials: Lithium Orotate, you can take it every day without worry or risks. Lithium Orotate on the house. As you can imagine, a carefully prepared scientific formulation like Brain Essentials: Lithium Orotate is an expensive product to produce. And normally, even after cutting out the “middle man,” each bottle retails for $59.95. Yet you don’t have to pay that price. Since you’re still reading, you’ve proven that you’re as serious as I am about growing new gray matter in your brain and supercharging your mind and memory. And considering what happened to my mom, this isn’t just “business” to me—it’s much more personal. 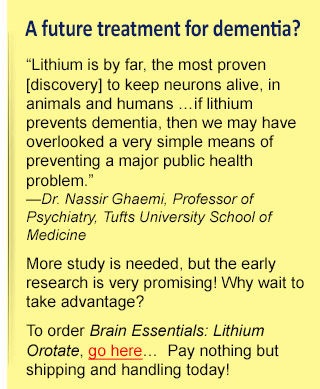 I’m so sure Brain Essentials: Lithium Orotate will give your brain a boost, I’ll let you try it for 30 days risk-free! Here’s my “no strings attached” offer – available from this page only. . . Try Brain Essentials: Lithium Orotate for 30 days risk-free. Pay nothing today except $7.95 shipping and handling and we’ll send you one bottle – that’s a 60-day supply – of this breakthrough supplement. If you’re not totally delighted with your results by day 30, just call or email us, then send back the unused portion – and we’ll never charge you another cent. This is a 100% iron-clad guarantee, so you can’t possibly lose. 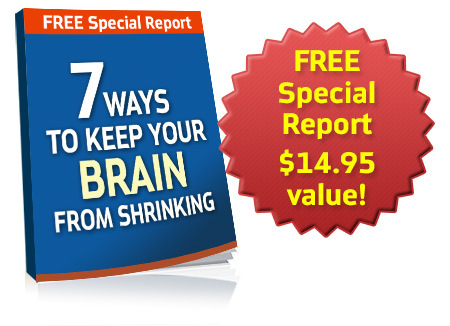 Plus, if you order your 60-day supply today, I’ll send you a valuable FREE Special Report: 7 Ways to Keep Your Brain from Shrinking. In this exclusive Special Report, you’ll discover how to protect your brain from the ravages of aging…how to slow down, even stop, brain shrinkage…and how to re-grow new gray matter. As you’ll see, it’s all possible with special nutrients and minerals like lithium…with powerful brain-protecting superfoods …and with simple lifestyle changes. It may sound crazy, but the manufacturers of Brain Essentials: Lithium Orotate have enough confidence in this breakthrough formula to take a chance and send you a 60-day supply now for nothing but shipping and handling. Just fair warning, though: This special introductory offer is only guaranteed until the current inventory of Brain Essentials: Lithium Orotate runs out—and when that happens, this extremely generous offer to try it now and pay later may disappear without notice. …click here to go straight to the secure checkout page and claim your risk-free trial of Brain Essentials: Lithium Orotate right now. When you do, you’ll see seals like the ones below that assure you that no matter what, your discounted order is 100% safe and guaranteed.